Hi everyone and Happy Monday! Did you all have a fun weekend? I had a few things going on, but I have to admit that the cold weather completely threw me and made me want to stay inside under a blanket and watch Netflix all weekend long. I, fortunately, did have a few fun plans that forced me outside. Here's a look at some highlights of my weekend, and make sure to check out the linkups with Katie and Erin! 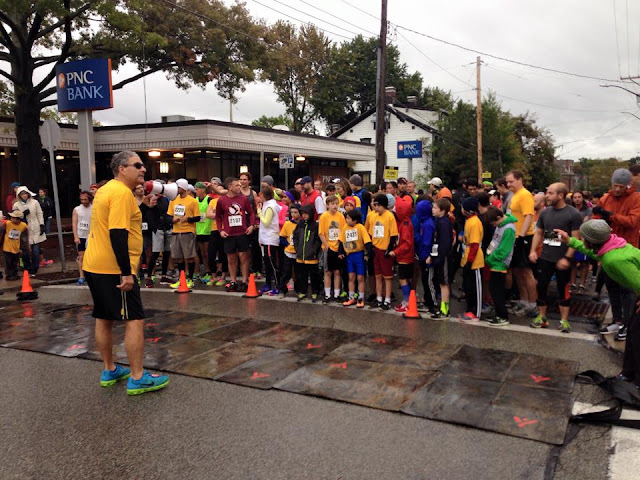 Dan and I did the Run Shadyside 5k on Saturday morning. It was a dreary, chilly, rainy morning for a race, but thankfully it cleared up by the time we started. If you've never done this race I would highly recommend it! The course is flat (for a Pittsburgh race) and there's a great breakfast afterwards. Dan broke his 5k personal record by exactly a minute, and we finished in 27:18! I'm trying to get him to write a post about his journey from couch to 5k to sub-30:00 races all in 6 months - hopefully you'll see a guest post from him soon! Also on the running front, I finished my final long run of my training cycle! I'm going to dedicate my post tomorrow to give my final thoughts on my training and this run in particular, but the TL;DR version is that it went really, really well and I'm feeling about 100 times more confident about the race than I did last week. A big chunk of the weekend was spent at my parents' house installing hardwood floors! I mentioned before that they're renovating the living room this year, and we're nearing the finish line. It was a lot of fun (and hard work), plus we got to watch the Penn State football game! The room is coming together so well, and it's making me excited to get my own house and start renovating! My boss and his big Italian family make their own wine, and host a huge wine festival every fall. There were so many people there, and so much food and wine! We also got to learn how wine was made and see them press the grapes for next year's batch. Thankfully the weather cleared up and it ended up being gorgeous out! Their house is on Mount Washington, so we had to stop by the overlooks and see the gorgeous skyline, which you all may have seen as every postcard of Pittsburgh ever. It really is amazing though, and I recommend taking the incline up to see the view if you're ever in town! Not picture are the sweats and sweaters I was in all weekend, and all the warm beverages I could get my hands on. I'm not exactly embracing this cold weather yet, but I'll get there! Did it get really cold in your area all of a sudden? How did your most recent race go? Congrats to Dan! So awesome! 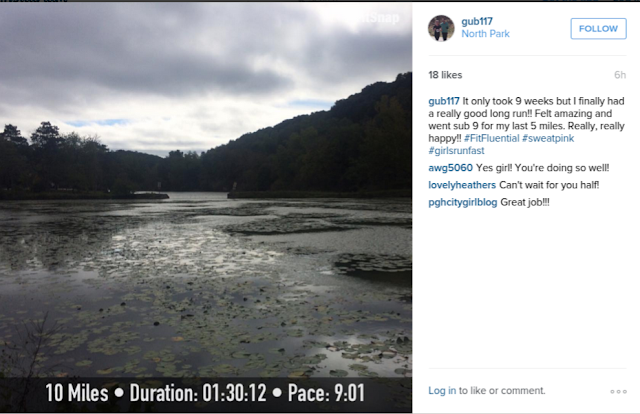 And yay for your confidence-boosting long run. I can't wait to hear your final thoughts on training. Also, you're the only person I know to use the words "fun" and "home renovations" together, haha! It was my favorite type of weather this weekend. It was perfect for shorts and either a light jacket or a long-sleeve shirt for lounging. The temps are fluctuating this week but the weather was great this weekend. I wish it was like that here! We went from tank tops and shorts weather to sweater and boots. No fair! So proud of Dan. I'd love to read about his journey! The weather is weird here. It's freezing in the morning but by afternoon everyone is sweltering hot. I'll pass that on to him! This week the weather changed back and it's just gorgeous most of the day. I wish it wouldn't change! Luckily, it's been pretty nice in Seattle the past few days. I'm in sweaters in the mornings, but it typically warms up enough by the afternoon that I don't need it any more :) You're going to be really thankful that you know how to install woodfloor when you get your own house! That's awesome! That's perfect weather for me! That's how it's been so far this week..thank goodness! I know right!! I just want to stay in my warm bed..
Congratulations to Dan on a new PR & you on your longest run. What a great weekend of running! That is wonderful about the homemade wine. Super cool! I'm glad your training cycle went well. Also, I once drove up Mt. Washington ... that was hair raising. My husband banished me to the back seat with my head down for the drive down. Yup, humiliating. It's definitely a crazy experience to drive up there! Luckily it doesn't scare me (too much) because the view is so amazing! Thanks Susie! Hard wood is the way to go! Those floors are amazing!! We're looking to replace our living room and kitchen floors with hard wood. Thanks! It's going to look so great once it's all done! Congratulations to Dan on his PR and to you for your awesome last long training run! You are ready! When I was a kid, my parents made wine out of scuppernongs (muscadines). Us kids thought that was so cool. HA. Thanks for linking up with us today! Thank you! I feel ready! I want to start making my own wine (and beer) after watching them..but it's so much work! Yay to the both of yall! I do hope you talk him into a post! It did turn cooler this weekend. Funny now in the spring at 58 degrees it's "Yay we can wear tank tops" then in the Fall it's "OMG it's so cold!!!!" Thanks for joining is this week! It cooled down here on Saturday and was pretty rainy. I imagine it was from the tropical storm passing by. By Sunday it was sunny again and warm. It's suppose to be nice here all week! Same here..cold and dreary on Saturday then beautiful on Sunday! Thank goodness my long run was scheduled for Sunday. Hoping the weather stays nice for my race! How fun that they make their own wine!!!! I love it! He always brings it for work parties and it's amazing. Installing hardwood floors?! So DIY ;). It was such a dreary weekend, I did a lot of Netflix watching haha. Congrats to Dan! That's an awesome accomplishment! Great job on your final long run in training! We put in hardwood floors in February. I love them!